It washed up nicely (and didn't turn the rest of the wash pink - always a good thing!). Here is another look at it folded up. That's a coming post behind it - in very similar and coordinating bold orange-red colors! 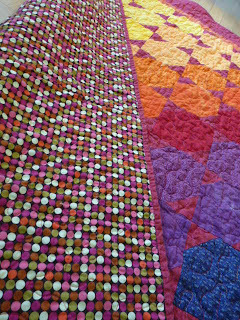 Michelle donated these fabrics and it feels SO good to have the quilt finished. Many thanks! Last week's retail therapy....Ahh... On Friday morning(which was my birthday), I went online to equilter.com and made a little order for myself. I rationalized that it was a present that I was certain to love. At about 2:30pm, later that same day, the postman arrived with a package, and the return address was none other than ...equilter.com! I did a double take. And it was addressed to of all people, my husband. I'm at first puzzled, and then it all makes sense. 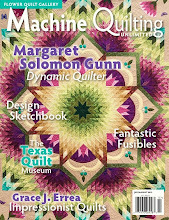 My mom had been over on Tuesday and was looking at a quilting mag I had. 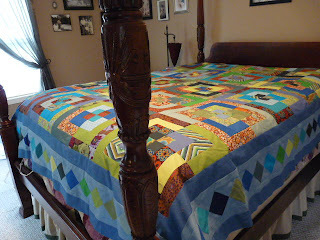 When she left, it was open to a quilt we liked, and on the opposite page was an advertisement for www.equilter.com! This magazine stayed out on the coffee table for a couple days before I cleaned up and put it away. I think my hubby must have seen it in his desperation to find me a present I'd like. Here's what he picked out. 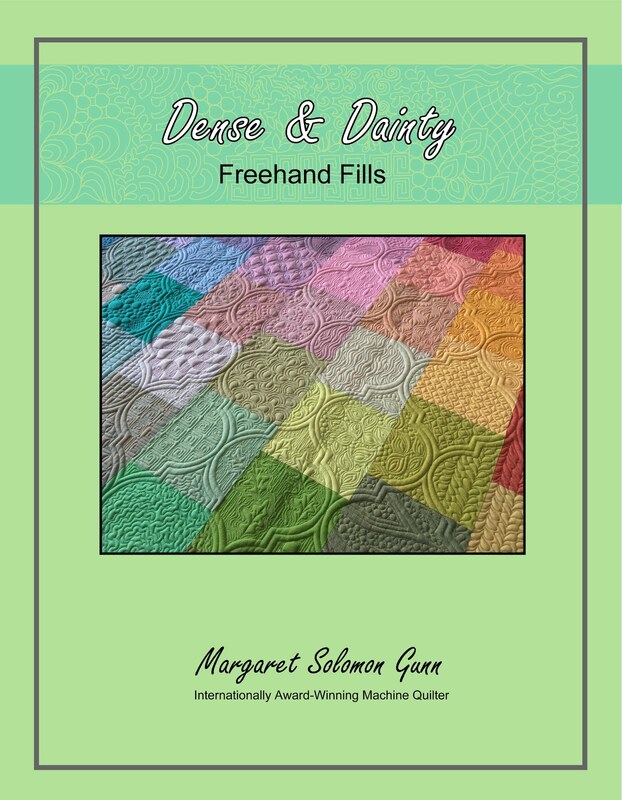 It's 25 fat quarters of hand-dyes (basic batiks). I don't think he really knew what to look for, or knew how adventurous my taste may be. Oh, I love the more printed Bali's A LOT! 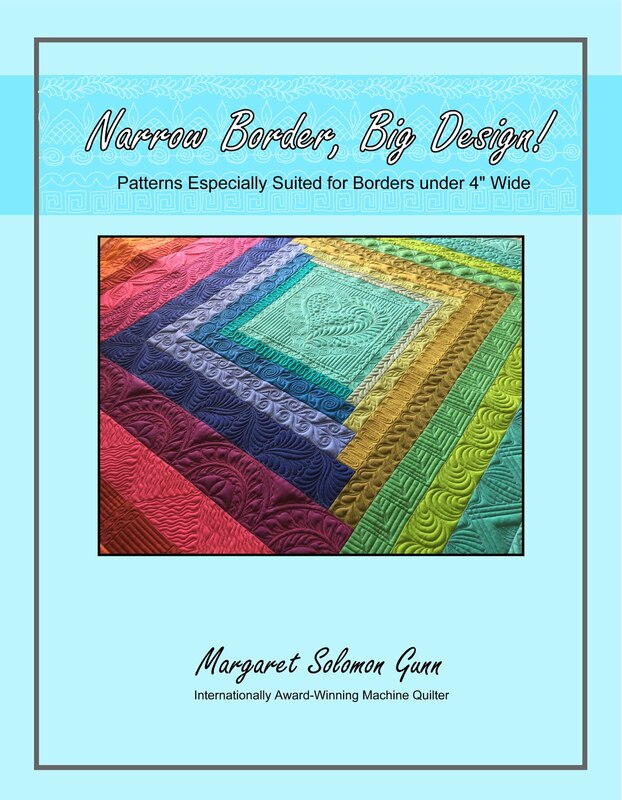 This is nice, and I am already planning, of all things, a quilt done with maybe multi-colored New York Beauty blocks. 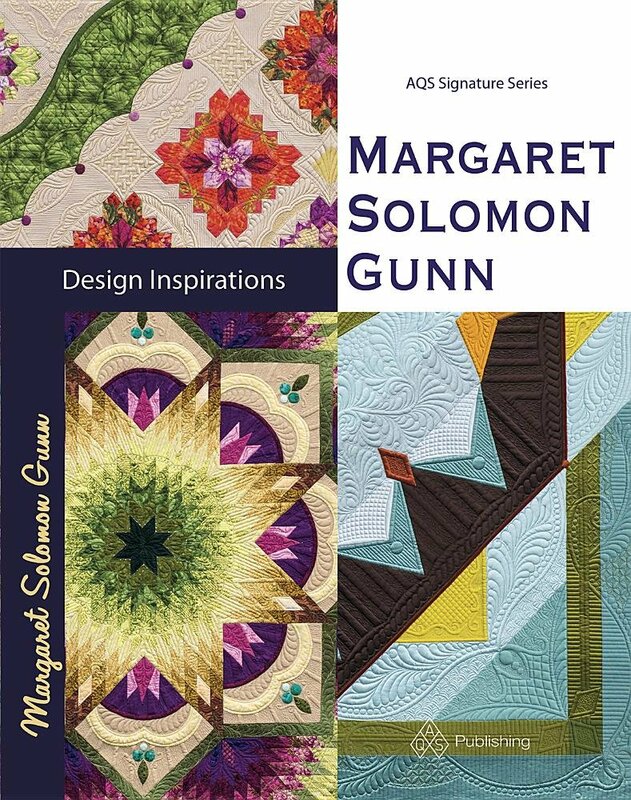 Maybe a larger project?...Maybe something to show at the Maine Quilt Show next year?... Time will tell. And here's the stack of therapy I picked out for myself. I added the black & white batiks on Tuesday after I saw what he got me. These are mostly from the Tree Top Fancy line. I was trying to get more of the pink birds, which I already had. It's hard to find though so I settled for some others. I'm not sure where these are going towards, but definitely a few pillows for Sophie's room and perhaps one for part of a twirly skirt for her. Otherwise, it's nice to have a few more modern options with which to sew. My sincere thanks to Tami for sending me this. Her craftiness is just lovely. Also, last week Anna sent me some Noah's Ark fabrics to use in Linus projects. It was incredibly generous and I am greatful. Thanks! So aside from still battling a sinus infection (yes, I will give in and go visit my doc today), I am also celebrating a birthday. Joy! Woo-hoo...Somehow when those birthdays are no longer in the 30's they are not as much fun. Being under the weather, too, makes me feel so much older. And grumpier. So I decided that I'd do a little shopping to celebrate. I'm not really sure what I will make, but I have a few yards of Tree-Top Fancy and a few coordinating other odds-n-ends coming to me. I have been trying to work through some other odds-n-ends of fabric that I bought last year. 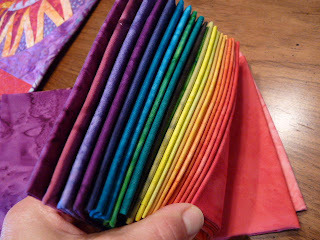 I had gotten some 10" Kaffe Fassett squares last year, thinking I'd know just what to do with them. I was wrong. First I didn't want to hack them up. 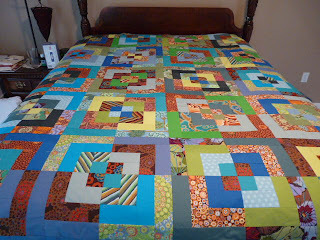 Then I just didn't want a quilt of 10" squares. Now, I just don't want a pack of squares laying around. So I strip cut about 2/3 of the squares and made these. I saw this quilt and loved it. Mine is not quite the same, but I still like it's busyness and color. Pardon the blurry-dim lighting; it's in the basement still. I also endeavored to clean out my stash some this week. 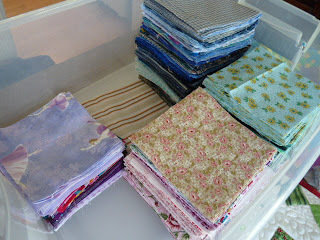 I have pulled all purples, blues and greens that I can only envision using for a donation quilt. Many of these are either under a quarter yard or were donated to me, or acquired somehow. Many are also something I don't love, but could use creatively to make something for others. 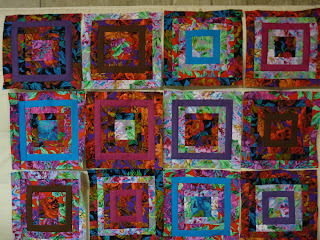 I carefully did not label them as "Ugly", but some are not lovely :-) I estimate (by weight) that there are about 1100 4-1/2" squares, or about 15 yards of fabric. I still need to conquer the red, orange and yellow bins...phew~! Here's my attempt at a watermellon. It's about 18" across, and is a simple table topper for a special person. I opted to not do the ants or black beads, so maybe it's not really like a watermellon. 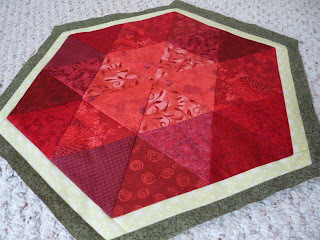 The back is just Kona in red, and really shows off the feathered quilting (actually done all in 1 thread too!). OK, not so much "No good", just not overly prolific sewing going on here. Last week I sent off some of my birthday block swap blocks. This one went to Debbie - she wanted a depiction of our favorite vacation place. Duh...France. 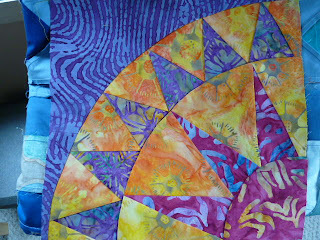 Here's a 12" NYB for Michelle in what have to be some immensely bold batiks. Honest, it is square and not as wonky as the picture looks. And a birdhouse for another swapper (Connie). Obviously, birds are not my thing. Or I should say, sewing birds isn't. We've actually been spending a lot of energy lately watching dueling hummingbirds outside my kitchen window. And for my version of the Four Seasons swap this summer, we are making sets of 20 of these "Colorblocks". I have actually made up close to 40 of them now. Just trying to get things off my list of To-Do's. Someone special's birthday is soon to pass and I have not made a gift. I envisioned this as a summer table piece, perhaps with a flag and slice of watermellon, etc appliqued onto it. 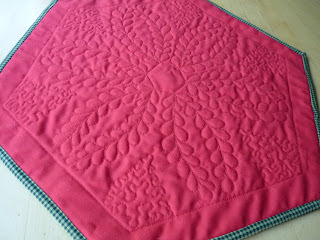 In the end, I pieced it and I'm not sure how much it actually resembles a watermellon. I am toying with embroidering the seeds in black, but making them resemble ants. Perhaps this is nuts. 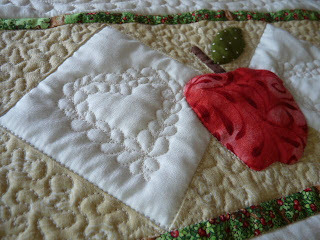 I hope ot quilt it this week once that plan is finalized. 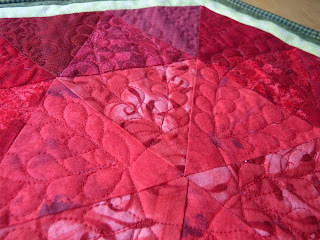 I also made my next part of a ALQS3 quilt this weekend, but I won't show it just yet. I still have this sinking feeling I may change my mind and keep this one. Sigh... OH how I love to create work for myself. 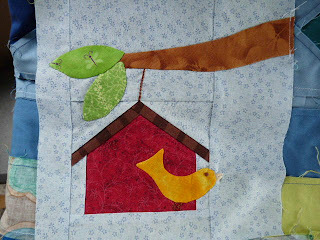 ~make double hanging sleeve for Little Dresses quilt. 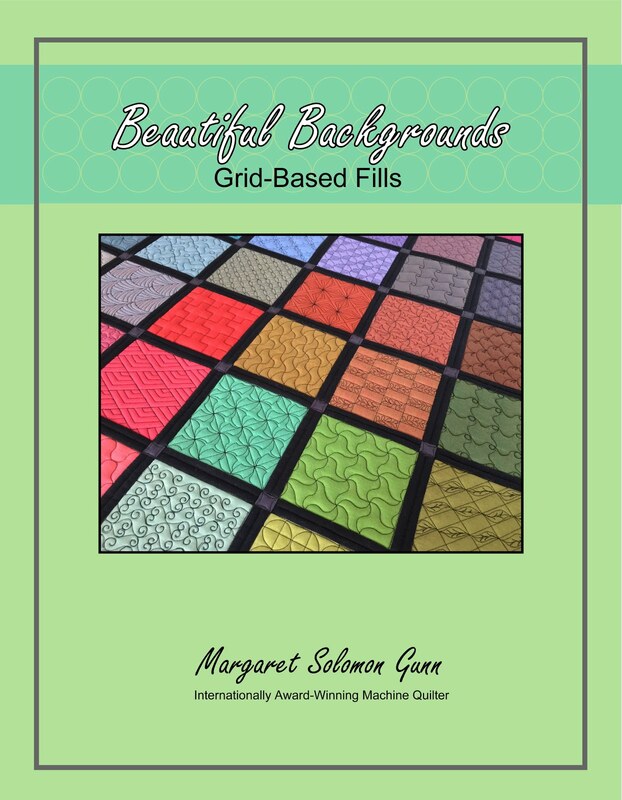 Needs this before it can be submitted for Maine Quilt show in July. It'll give me some evening hand work to do. ~I have a round robin and a row robin expected to arrive any day. I have plans for both so these should only take a few days. Just need to see them in my hands to match fabrics. ~Find a design for an appliqued Orca. You'll have to stay tuned for what this is for! Here is this week's major project. It's a table runner for my son's 1st grade teacher. School gets out in 4 weeks, but I wanted to get this done during my project lull. It measures 15" x 30". Initially I felt a little guilty making what on paper seemed so simple and quick compared to last year's grand adventure, but now that it is finished, I totally & absolutely LOVE it. I wish I could just keep it. 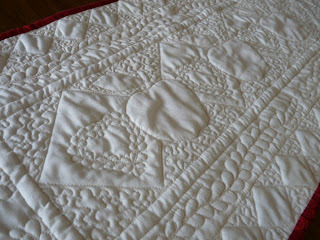 It is hands down, my best attempt at machine quilting. The MQ gods and planet were definitely aligned. No tension problems. No thread run outs. Good design & execution. I couldn't be happier. Unless of course if it were mine, but I don't have plans in the next 3-4 weeks to have the time to make another. Here's some detail pics. I did feathered hearts in the diamonds. 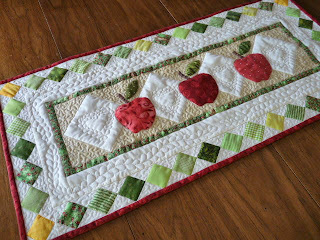 It was challenging not to encroach on the appliqued apples, but they look pretty good. I quilted with a soft tan thread so it definitely shows against the ivory Kona. The feathers of the border were also free-handed. I marked a curved line and just stitched. Not too bed, eh?! ...And I love how the diamond setting stones pop on account of the stippling and ditch stitching around them. 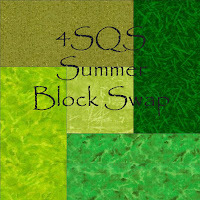 Looking for a simple and colorful block swap? Then look no further. 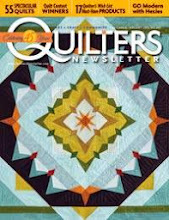 The Four Seasons Quilt Swap is branching out on a different venture. Won't you join us? And a very Happy Mother's Day to you ladies. 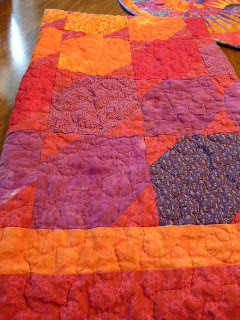 The quilt flimsy for my oldest son is nearly completed. I added the diamond border this weekend. I love the way the border tames down the wildness of the Bento Box pattern. 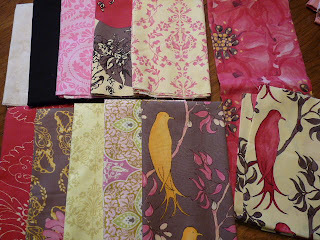 I never did use the inspiration fabric from which all of these fabrics were selected, but it will go on the back. My son's room is in shades of the dusty blue so it ought to look good. Although, he was begging to paint his room this morning. It's always something! I have been puttering, mostly this week. 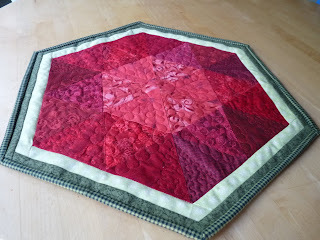 Without a stack of flimsies to quilt or a pile of blocks to sew, my direction is confused! I have hand sewn/appliqued one of my birthday block swap blocks. I'll show all of them soon - one is still on paper, as it is a New York Beauty. I'm not that motivated to conquer it. HA! I am going to a local fabric fair tomorrow morning. I heard of it a couple years ago - it's known for having dirt cheap bargains! Just hope my daughter won't be still under the weather so she can go to her last day of daycare (and I can have my morning in peace.). 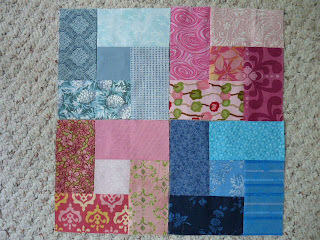 I sewed up 40 9-patch blocks for the 3 by 3 swap I joined. These are fast! 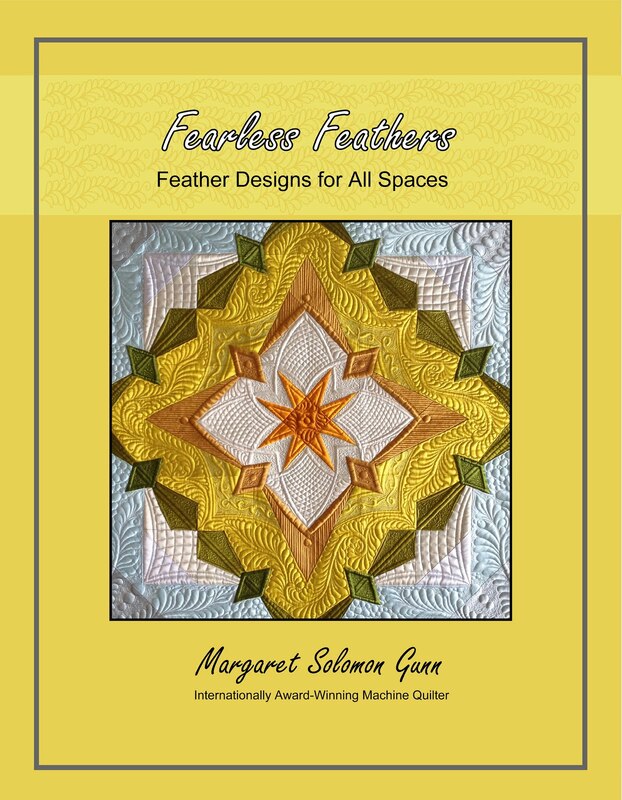 And, if you are a follower of the Four Seasons Quilt Swap, you know that I am gearing up for a Block Swap, of some form or fashion. Check it out if you think you might be interested or may have some block suggestions for me to consider. And a happy one it is. I learned this morning that I was selected for an award from my department. It comes with a very nice $2500 check too! Cha-ching (the fabric bells are going off!). It was a complete surprise considering I only teach classes part-time. Now I have to get myself a respectable thing or two to wear before next Friday, as there is a banquet to attend. The rest of my materials for the Bento Box quilt arrived this morning. I discovered earlier this week that I likely did not have enough Kaffe prints to do the entire quilt, especially if I expand it from a twin to a queen. So a nice shopping trip was an order. I also needed a few Kona solids, but really wanted to order all of this from one place. I opted to try the Moda Bella solids instead, hoping they'd look and feel close to the Konas. And they do - they are a nice weight, and sew beautifully. I just lOVE the Kaffe Fassett Millifiore (on the right) - I tried to get a couple more colors, but it's sold out in many shops. Here are the first nine of these 16" Bento Box squares. I have made them larger than the typically seen 12" block. I like the look with the added row of color. Individually, each block is wildly colored, busy, and borderline scarry. In person, however, this is looking so nice - reminds me of looking at a grove of trees, with the clear blue sky showing through the greens and browns. It's boyish and loud, without being garrish. I still hope to somehow incorporate this feature fabric - the one that all of the others were chosen with which to coordinate. Perhaps a binding. Maybe somehow on the border. Or just on the back. Don't know yet. I have been remiss this week in a major way. Last week I signed on to Lisa's Pay it Forward. I failed to post this sooner, but the first three people that comment, and agree to also send three people a handmade gift in the next year, will also receive one from me. Long winded and convoluted sentence, but you get the idea! I also signed up with a easy little swap that Anina of Twiddletails is hosting. We are swappign 6" 9-patch blocks. 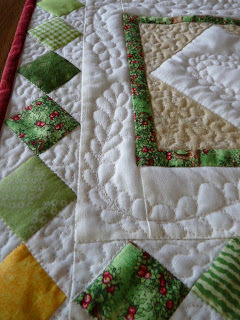 I love the look of a little old-fashioned 9- patch quilt. We should get either 32 or 48 mostly different blocks from the swap. 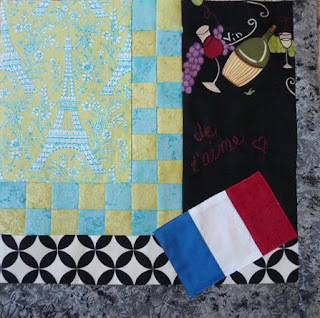 Worst case, they are quick and easy to make and it's a sweet donation quilt.